I have a 9 month old Dobe, and he's the happiest friendliest little puppy I've ever met. I eventually want to introduce him to protection work, so I'm wondering if OVERsocialization could be a problem, as when we're out in public, people just want to approach him and tell us how they haven't seen one in 40 years. But I don't want him to just get used to being approached by strangers all of the time. He's got a rather high prey drive, but he's also scared of his own shadow at times lol which may just be a result of him being so young. However, I wanted to find out the general age you begin introducing them to the protection work, how, and what sort of temperaments seem to naturally respond to protection work the best. When to begin ? IMO from the moment you bring them home. Good idea to locate some clubs in your area that specialize in this area of training. This will allow to to watch and ask lots of questions once you find the right place for you and your pup. FYI: Lots of liability with a dog specifically trained for protection so you want to locate that perfect trainer and do things right from the beginning. To hard to undo negative behavior. Looking forward to hearing more details from you as you go down the road of protection work. A lot of people may not like my answer however I do not let anybody or everybody pet my dog. Yes he knows people that I know and we train in Nose Work so he is getting petted. People I do not know on the street or where ever my answer is No Thank you. If they just reach in to pet then I body position myself in front of my dog. People should always ask first before petting and it is the owners decision to allow or not. I've had a lot of Dobes over the last 59 years and I've never had to train one for personal protection. I made sure they were very well socialized. They all showed in Conformation (some successfully and some not so much) and later in performance stuff (Obedience, Rally, tracking, Agility) but when my very first Dobe was in a bench show up in Canada a man came over and introduced himself and told me he was a professional dog trainer. Trained dogs for Schutzhund, police and military work, and for personal protection and that of all the dogs he trained the failed conformation show dogs were not only the easiest but the most reliable when everything was said and done. At that point he grabbed me by my arm and jerked me sideways and my not quite a year old Doberman came off the bench (and I'd have sworn he was dead asleep) and hit the end of the bench chain so hard I was sure he was going to pull it loose. By this time the man let go of me and was saying "Tell him you are all right..." I did, and my dog settled back on the bench but continued to watch us very carefully. We talked for some time and he said that successful conformation dogs tended to be very stable, had been so well socialized they had seen enough stuff that they had a pretty clear idea of what was normal and what was not. I've had occasion to see this in action many times since then and I firmly believe he was right. Over time I learned more about stuff like Schutzhund (now IPO) Ring and definitely personal protection. Actual personal protection trainers are not common and there are a lot of bad ones around my recommendation is that if you are serious about training your dog for personal protection you find an urban Police group with an active K9 unit and find out who they have training for them (ultimately the K9 officer does all the final training with his K9 partner to be). And find out the real down sides of having a protection trained dog. Things like the fact that if you ever have to board your dog many kennels (most actually) won't take a protection trained dog. A lot of rentals (if you don't own your home) won't rent to a you if your dog is protection trained. At 9 months your puppy should be friendly and outgoing. I don't always let people pet my dogs either--I just tell them that he's being trained. I never let my puppies play with other dogs while they are on leash. I really don't want them to be pulling on the leash or barking at other dogs hoping for a play session. Play is off leash in a safely enclosed area with dogs who I know. Not everyone will agree with me but I've been pretty successful (and lucky) with my dogs and have had plenty of evidence of their willingness to protect me with no real training in protection. That’s a great idea ......to find out who the police group is using .......in your local area. Do you mean competition/sport protection (as in IPO/Schutzhund) or personal protection? There's a big difference between the two. In my opinion, all dogs should be properly socialized. That doesn't mean meeting and interacting with EVERYONE, but that does mean being out in the world, seeing what's "normal" and what isn't, being exposed to things, etc. Dobebug's post is excellent, as always. dobebug and Gretchen_Red like this. I went back and read your posts and it looks like you're wanting to possibly do IPO? Without your puppy's parents competing it's hard to say if your dog will be successful at IPO or bite sports. As Dobebug mentioned most dobes are protective naturally as it comes to barking. They don't always have the confidence to lay a bite but the last thing you should want your dog to do is bite someone, that should always be the VERY LAST resort. Dog bites come with a lot of setbacks, one could be the death of your dog. Most in the sport start training their puppies at a very young age. They even go as far as picking out the best puppy from the litter who shows the most compatibility with the sport. For instance, my puppy had a better and longer grip than many of her littermates. She also showed a bit more confidence in other testing as well. From there we spent time playing soft tug and soft flirt pole type of work as I continue to develop her self confidence as well. Part of confidence building is allowing her to jump on me as we play or when I come home. All of my puppies jump on people until they reach an age that I feel they are safely confident. Then I don't discourage jumping but I encourage greeting me with a toy or with paws on the ground. If you teach your dog that it's not ok to jump on people then you're teaching them that it's not ok to jump on people yet expecting them to do that when a stranger appears. She has already begun to show protection instincts towards odd behaviors. I got a chuckle out of your comment about Dobes being protective naturally when it comes to barking. Most of my dogs don't bark much. They don't tend to be noise sensitive but I am--VERY! So I discourage barking. I think of all my dogs who have been through and the WAE and received their WAC only one of them barked. 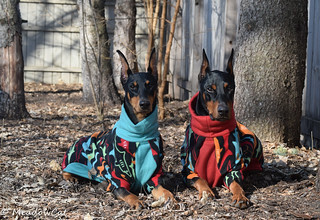 I find that most people (including the pair of teenagers who were trying to crawl into my house via an open laundry room window) who see a Doberman sitting and watching them they loose interest in whatever it was they thought they were going to do. The teenagers decided that the one that was actually in the laundry room and the other that was half way through the window that when I told them if they didn't stay to wait for the police I'd called that I would turn the dog loose--they preferred to stay where they were. Ditto for the four teens who encountered me on a dark street and thought they'd like to harass me some--what they hadn't noticed was the leash in my hand. The Dobe on the end of the leash stopped poking around in the bushes where he was looking for a good place to take a dump and stood in the street and gave them the hairy eyeball--they changed their mind about coming across the street to see what I was doing. Occasionally one of my dogs has barked at night--that will get me up to see why. The last time it happened it was Toad who barked and he was maybe three years old--I let him out the back door--said, loudly "See what's out there!" Shortly there were sounds of a dog running and a person running--the guy in the back yard made it over the fence before Toad got there--just...when I went out the next morning to look at the fence (it was old and rickety) the was a good sized chunk of denim--looked like it was from a pant leg--had tooth holes in it. I think silent pursuit and silent observation by a big dog with the reputation of a Doberman is often much more effective than a lot of barking. We may insist that these dogs are medium sized but to the average Joe Blow the look pretty BIG.